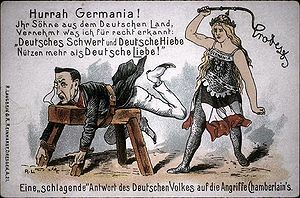 Political caricature of an F/M whipping. A whip, also known as a lash, is a relatively long, flexible, cord-like implement for corporal punishment and/or controlling animals, typically with one or several tails or lashes attached to a handle. A whip with a single tail is also known as a single-tail whip; a whip with two or more tails is a multi-tail whip. The tails can be made of any material, common are rope, leather, and rawhide. Leather thongs can be flat, rounded, or braided. More exotic types of whip include hair whips (e.g. horsehair whip) and looped whips. 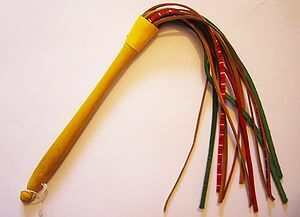 Whips are also popular for whipcracking, and were also once popular as a children's toy. There are many different types of whips. See below for examples. Materials for whips include leather, rawhide and cord (whipcord, rope); metal (e.g. chains) is used for some types, and also various modern materials such as rubber and silicone are occasionally used. There is no exact definition of what makes an implement a whip. 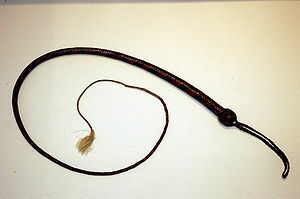 A leather strap or tawse is usually not called a whip, but the existence of a handle is not a suitable criterion: there are whips that have no handle, such as the snake whip. A crop is usually called a whip although it is as stiff as a cane, which isn't. This page was last edited on 10 February 2012, at 21:46.